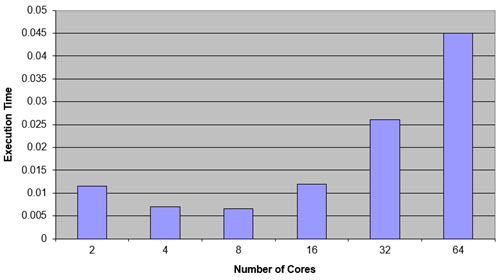 Did you know that for many reasonably-parallel applications multicore starts to degrade performance once more than around 8 cores are used? Engineering without metrics isn't engineering. That's art. Engineers measure things and use the numbers to guide their work. That's what my Better Firmware Faster seminar is all about. This one-day event shows quantitatively how to improve your firmware processes. Find out how you can bring this class to your facility, to help your engineers achieve world-class code on a shorter schedule. More info is here. "I love fools' experiments. I am always making them." Charles Darwin. 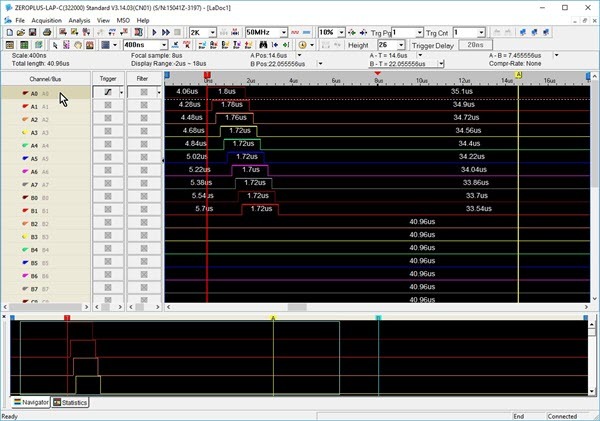 One way to extract debugging info from an embedded system is send it out over a serial interface, such as I2C. Most digital scopes can decode these interfaces, so you can watch the data in real time. Don't have a serial interface? If you've got two GPIO bits, then you do. This video explains how. This month marks the 100th anniversary of the invention of the flip flop. Now, that was long before transistors... and not long after tubes were invented. More here. 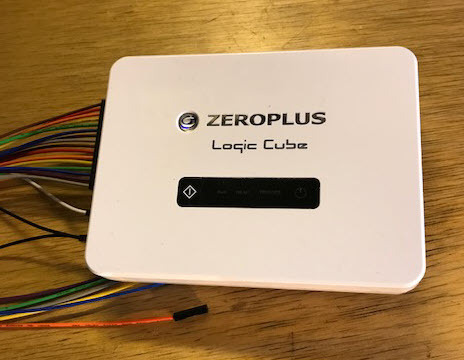 This month we're giving away the Zeroplus Logic Cube logic analyzer that I review later in this issue. This is a top-of-the line model that goes for $2149. If you've raised teenagers you've probably been frustrated when the young folks seem unable to learn from anyone's experiences other than their own. Each generation seems to repeat the same mistakes. That's the reason I often write about embedded disasters; we engineers had better learn from the failures of others, so we don't get caught in the same trap. But it's wise to sometimes reflect on what has gone right in this industry. One of those areas is that of power management. Not infrequently the This Week's Cool Product section of the Muse is some sort of power management IC. If you haven't followed modern power handling, prepare to be astonished. Did you know the SoC in a mobile phone has multiple voltages, and those values are changing constantly in response to SoC demands? A sudden need for major computation will cause the power-management chip to scale the voltages up; when there's less to do they ramp down to save the battery. Some of these SoCs have proprietary schemes to reduce the applied voltage to just above the point where the transistors become unreliable. Multiple power domains allow parts of the SoC to shut down when not needed. Or did you know a modern high-end CPU, like the one in a PC, can take over 100 amps? That's incredible for a square centimeter of silicon. Sometimes there are nearly a thousand "pins" just dedicated to power and ground. At the other end of the spectrum some MCUs can run for years from a coin cell, though getting this to work is much harder than it appears. I was reflecting on this when a press release for Analog Devices' LTM4661 came in. It's a new voltage regulator that can supply 4 amps. The entire thing, other than some external capacitors, is in a 6.25 x 6.25 mm package. I often show visitors their ADP172 which is a linear regulator that is in a 1 x 1 mm package - so small it's hard to see. In the olden days all we had were linear supplies. Where I worked we had custom-made transformers to reduce the mains to lower voltages which were rectified and filtered. The filter capacitors were big beasts about the size of a drinking glass. The filtered voltage went through one or more paralleled power transistors to the circuit boards. The transistor's base controlled the voltage coming out of the transistor; the base itself was driven by a circuit that adjusted the base voltage to get the required 5 volts (or whatever was needed). If one wanted regulated 5 volts from the supply, it was common to pick a transformer that output around 12 volts. The excess was to account for diode and transistor drops, as well as variations in the AC input. If 12 volts went into the transistors and 5 was wanted to the circuit, say at 10 amps, that meant 70 watts was converted to heat in the transistors. Wasted. The transistors could burn up, so they were bolted to large heat sinks, often with a fan. The power supplies were often larger than the logic boards. Linear regulators are simple and reliable, but very inefficient. A solution, the switching regulator, came into being in the 70s. The idea is that the series pass transistor is always either completely on or completely off. An inductor and capacitor convert this pulsing waveform into a nice steady DC level. The circuit needed to control the pass transistor is somewhat complex. Since the transistor is either on or off (that is, not in a partially conducting state) little heat is generated and the regulator is very efficient. You'd think that with all of the switching going on the DC voltage would have a lot of ripple, but that's not the case. The previously-mentioned LTM4661 has only about 3 mV. Efficient use of power is desirable, but in some applications is critical. Companies that build very large uninterruptable power supplies that run entire data centers will do almost anything to get even a fraction of one percent increase in efficiency. These units provide thousands of amps; every extra wasted watt goes into the air, which means more powerful air conditioners are needed. Those, too, sometimes run from the UPS, resulting in even more heating and yet a need for a bigger A/C, in a vicious circle. The ucc28881 is under $2 in singles. Parts like it have made designing these sorts of power supplies easy. And they are reliable. But it wasn't always so. In the 70s I worked for a company that made all sorts of instrumentation. One unit - which, happily, I wasn't involved with - measured fat and protein in ground meat using optical techniques. For some reason the lead engineer convinced management that it needed an offline switcher, which he was happy to design. How hard could it be? 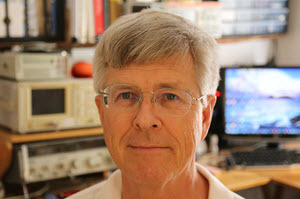 None of these nifty ICs were available, so he designed a power supply using discrete components. It was complex. It kept failing, always spectacularly. After all, a wall outlet provides a lot of energy. The one-month design cycle stretched to over a year. The machine eventually went into production and thousands were shipped. Every time there was a thunderstorm in the Midwest, hundreds of units blew up. The extra energy lightning coupled into the AC mains was more than the design could withstand. That product nearly bankrupted the company. We've come a long way, in all aspects of electronics design. Duane Mattern responded to last issue's comments about tin whiskers. His TV failed. Suspecting a whisker problem, he put the main board in the oven at 385° for ten minutes to reflow the solder... which fixed the problem! Here's his technique. Last year our TV died. Not being clever enough to try baking boards, I simply replaced the entire unit. But I usually dismantle failed products to see how they work and what tech is inside. The electronics was interesting, but, better, there were two huge sheets of plastic. Figuring they might be good for something, someday, I saved them. 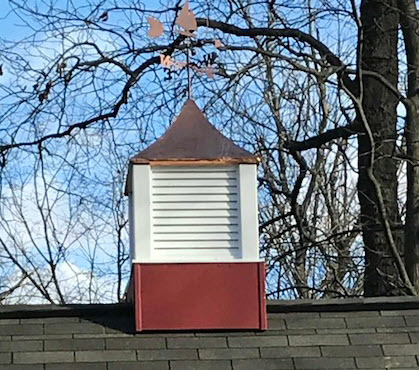 Last summer we finished building a barn, but it really needed a cupola. That plastic was the perfect substrate for the curved pieces under the copper. The user interface is a little intimidating at first. Pretty much everything can be controlled from the quick-access toolbar. The waveform display shows fairly tiny signals, at least to my old eyes. I wished I could make them bigger in the vertical dimension. Turns out, they can be any size you'd like. In fact, the font size selector is right there on the quick-access toolbar. Just about everything on the screen can be configured: font size, colors, shortcut keys, tool bars, etc. 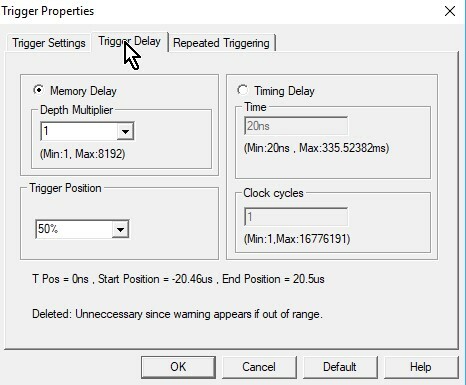 With logic analyzers it's all about the memory. The LAP-C is nice in that it can filter signals to use less of that resource. That is, samples are stored only when certain user-defined signals are high or low. 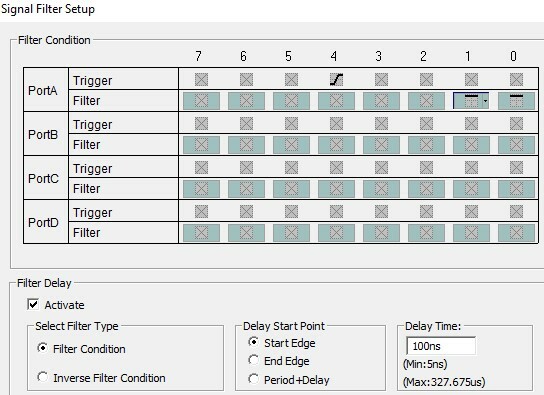 And, one can add a delay so signals are filtered for a period after the filter condition is satisfied. I don't like that you can't scroll left and right through the waveform when the unit is repeatedly acquiring. Q: Do you know a good GDPR specialist? Q: Can you tell me their email address?